I have never been a fan of spending time before or after a workout stretching; I felt like I didn't have the time for it and found little to no difference in doing so. When I started to get more involved in CrossFit, particularly the Olympic lifts, I quickly figured out that my mobility was what was my limiting factor and not just my strength. With a little research, and some instruction from others at the gym, I discovered other methods to improve mobility besides stretching: primarily smashing, and flossing. For this particular exercise you will need a hard ball, like a lacrosse ball or tennis ball. You can get one for about $7 on Amazon, or at a local sports store. 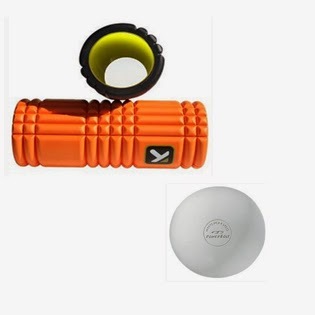 And while you're at it, pick up a foam roller (I recommend the Grid because it won't go soft over time) because I'll be recommending other mobility exercises using that later. When talking about the rotator cuff, we're referring to the group of muscles and tendons that are responsible for the movement of the arm inside of the shoulder socket. In particular, we are concerning about the external rotation of the shoulder. This particular movement is what generates torque, like when a baseball pitcher throws a baseball. The primary muscles involved here are the infraspinatus and the teres minor. Unfortunately, the modern lifestyle of spending most of your time sitting in front of the computer has left us with poor shoulder posture (rolled forward in a "hunched" position). This position contributes to tightness the infraspinatus and teres minor, which can lead to shoulder pain and injury. To deal with this problem, we are going to smash and floss that area. Lying on your back, take a lacrosse ball and place it right above the insertion of your lat near your armpit (the red zone in the left of the picture below). Tack down your shoulder as far as it will go. Extend your arm straight out and bend your elbow at 90 degrees. Note: this should already feel pretty painful if you are doing it for the first time. Lower you arm until you reach as far as possible (ideally you want to touch the ground, but if it isn't going don't force it!) and continue to move back and forth. Continue this for 2-3 minutes and then switch arm for another 2-3 minutes. If you don't feel anything, you can adjust the ball around to 'hunt' for the sweet spot. Try to do this on any day that you are dragon boating (or at least on any days that your shoulders are bothering you), and it should reduce any shoulder pain that you normally may experience. Even though you may only paddle on one side or only feel pain in one shoulder, I strongly suggest that you do this on both sides. This will also help anyone with forward hunched shoulders.